I went along to the impressive Scottish Caravan and Outdoor Leisure Show. 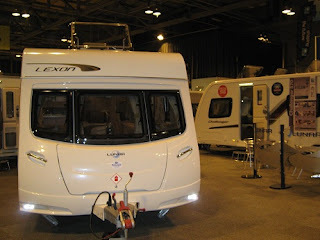 We are tent campers but I went along to have a look at the different options if we were to upgrade to a dream caravan or motorhome. I must admit I much preferred the motorhomes and there was a huge number on display although motor homes are generally more expensive than caravans. 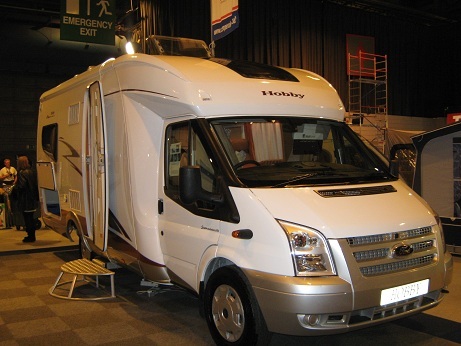 A new four or six berth motor home varies in price between about £40,000 to £60,000. You can get a smaller raising roof type camper van for about £15,000 and caravans seem to start at around £10,000. I hadn't realised that motor homes are based on a van model eg Ford Transit and are then converted or kitted out by different manufacturers. So you can choose your base model of van e.g. a Ford or Peugeot and then also choose which company for the interiors. 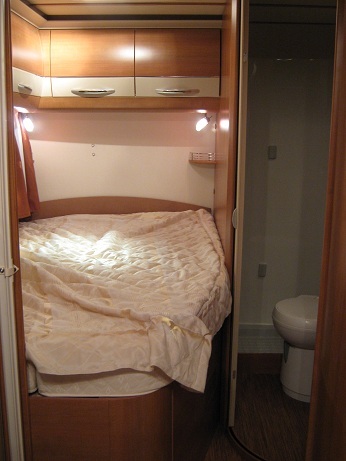 The two pictures above show two views of the interior of the following four berth motor home based on a Ford Transit. This was a lovely motorhome and was the first one I looked at. That would do me fine ! Now all I need to do is find the money ! 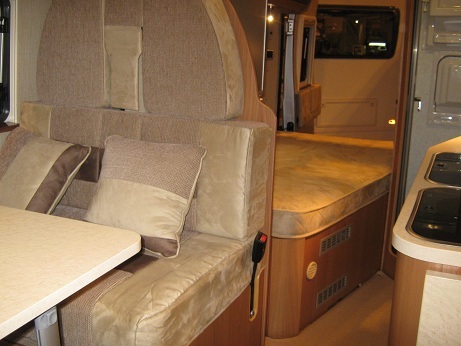 When buying a motor home remember to think how many passengers will need to have proper strapped in seats. If you are a family of 5 or 6 you will need to make sure you have the right number of seatbelts. 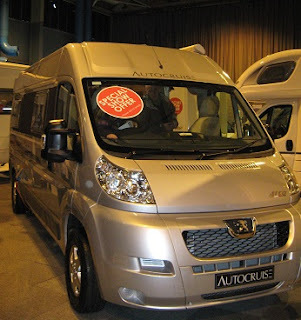 These next two photographs show the interior and exterior of a Peugeot Autocruise Alto Motorhome. This also had an awning you could pull out to the side of the van to give you even more space. 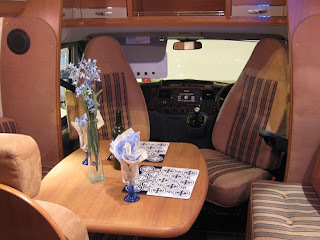 It can be difficult to maneouvre some models of motorhome and one thing to watch out for is models which extend far beyond the rear wheel as apparently they are harder to drive so if that worries you watch out for that. For example in the Peugeot one shown here it does not extend far beyond the back wheel, so should be easier to maneouvre than one that extends far beyond the back wheel. I had a look at a 29 foot motor home - this is the same length as the fixed mobile homes we have rented in France ! However these do seem a bit excessive and driving them must be very stressful. The Caravan Club was offering free "Try Driving a Motorhome" sessions at the show so I signed up for one of those. It wasn't too difficult to drive but then we were only negotiating the car park ! The motorhomes' prices tended to vary between £40,000 and £60,000 but a good alternative is to rent out your motorhome through one of the rental agencies. I spoke to a couple who were at the show and it seemed to be a fairly smooth process. You decide which weeks you want to make the motor home available for rental and they can do all the arrangements and insurance etc for you. They can also help you to buy a motorhome and also have offers on second hand motor homes. For example I saw an offer for a second hand 6 berth motor home at £29,000 which didn't sound too bad ! 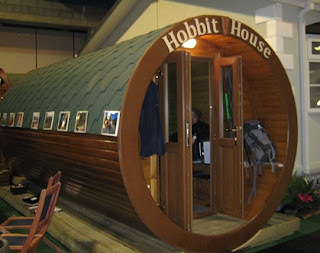 Other interesting things I saw at the show included these "Hobbit Houses" which are now being used on various campsites! I also liked the Microlodges which were similar ! And also a folding boat ! 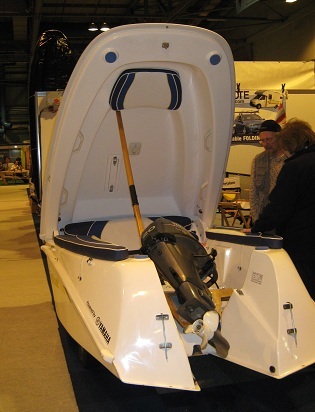 - I imagine these are useful because they are not so large to tow as a full length boat ! And although I went along to the show only to look, you've guessed it ! I spent some money ! I found some lovely plastic wine glasses with coloured stems from a camping accessory firm based in Jedburgh in the Scottish Borders. They also had a lovely range of colourful camping kettles. And I also bought a sauce mix from "Look What We Found" and I found a lovely planter which will make a good birthday present. So I would thoroughly recommend the show for not only caravans, tents and motorhomes but also clothing, garden furniture (some great examples), garden play equipment, loft ladders !, cooking equipment and camping equipment. I will definitely be going again and make sure you catch the show wherever you are in the next few months. Many of the exhibitors go from show to show and only sell through these shows. 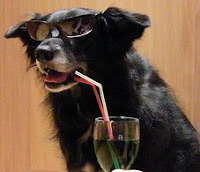 And once you have bought or rented your motorhome or caravan or decided to stick with your tent for the time being then you will find some lovely sites to camp in France at our website at http://www.bestfrenchcampsites.com/ !